SCRUBBOX, AOM’s high-efficiency kitchen exhaust electrostatic air cleaner, leverages on electrostatic precipitation to provide effective containment of particulate matters, grease, oil, water vapour, smell, and smoke generated from cooking to the strict standards set forth by Singapore’s National Environment Agency (NEA). It is also tested to stringent ASHRAE and ISO standards. In addition, SCRUBBOX comes with worldwide-recognized UL, ASHRAE, ISO, CE, FCC, TUV, and SGS certifications to attest for its superior safety, quality, and efficiency. 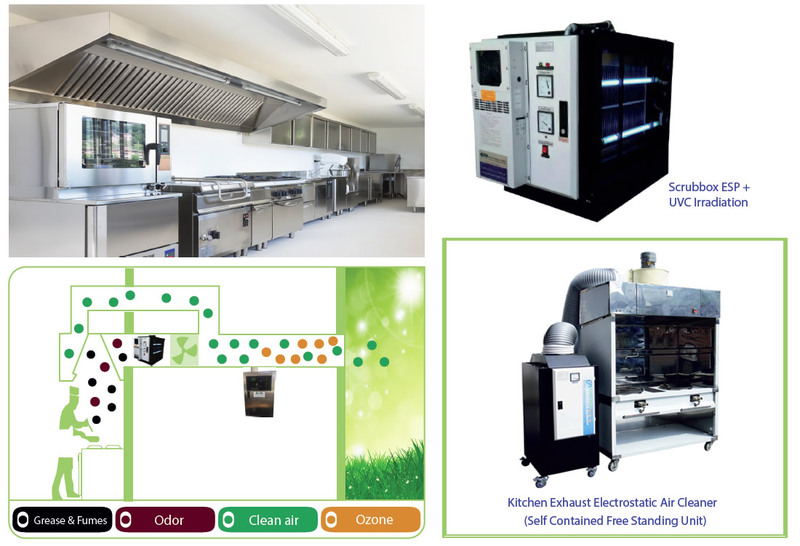 SCRUBBOX S, the latest kitchen exhaust electrostatic air cleaner series by AOM, is the world's first single-unit Electrostatic Precipitator (ESP) equipped with double-pass function to optimize performance in kitchen oil and grease containment.